Tag Archives for " John Chen "
If you’re a professional or job seeker (which, if you’re on the DTM blog, you obviously are), you’ll know that LinkedIn is the biggest, baddest kids on the block. 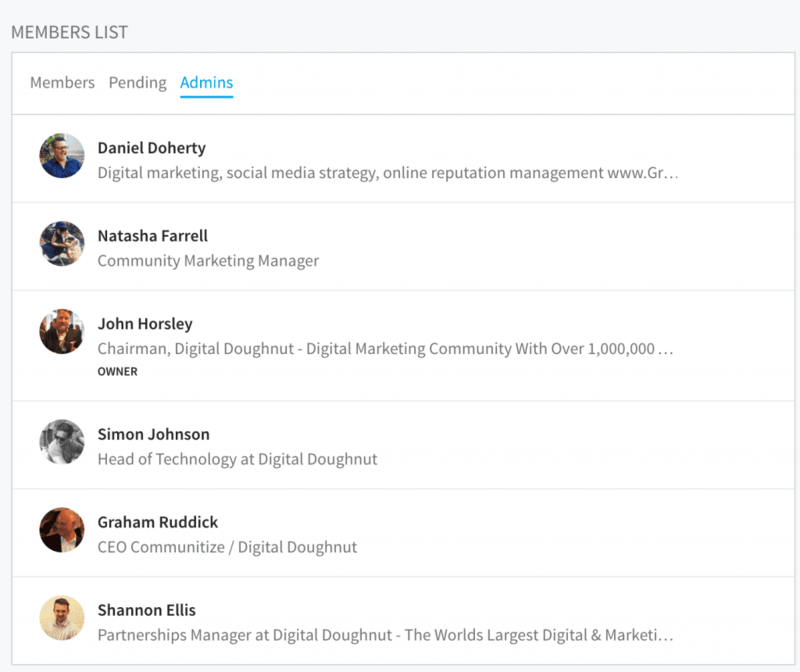 With over 400 million users to date, a recent acquisition by Microsoft, and a revamped user interface, LinkedIn seems poised to be the best platform for you to get leads, job opportunities, and keep the conversation going with the white collared community. A recent survey by the Content Marketing Institute found that a staggering 89% of B2B marketers focus on LinkedIn as their main platform, making it one of the highly sought after platforms to master when it comes to B2B content. That’s all good fun, but now comes the hard part. How do you actually generate Quality Leads from LinkedIn consistently, besides having a powerful LinkedIn profile? Now, let me start off by saying that there’s more than one way to do it. In fact, there are so many ways that I’m still in the process of crafting a comprehensive guide on LinkedIn marketing (13,000 words and counting) few weeks in. Today, I’m going to share a little secret with you, and teach you one of the best ways I know how to generate continuously leads from LinkedIn. In today’s article, you’ll learn how you can generate a steady stream of leads, new conversations, and opportunity from LinkedIn (in a non-spammy way). You’ll also learn about the two different aspects of LinkedIn groups, and how you can leverage on both sides of the virtual fence, to bring your business to the next level. In general, there are two ways of looking at LinkedIn groups. The first aspect of LinkedIn groups is from the perspective of a member. A member of a LinkedIn group has restricted capabilities, and there are certain restrictions to what he or she can or cannot post on the group. 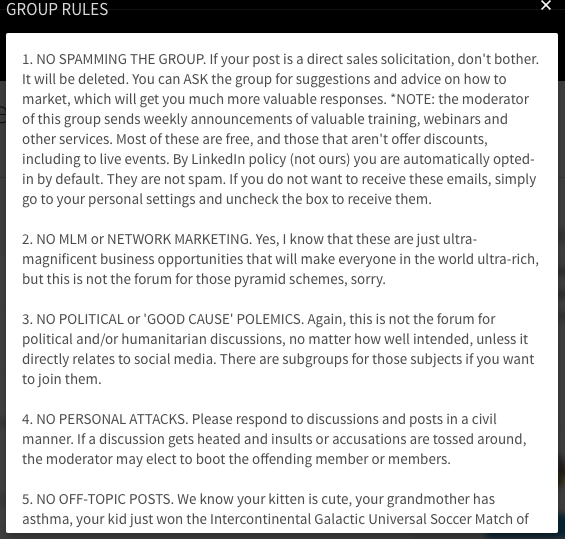 These group rules vary from group to group. In other words, whatever content you share, such as a piece of content, on the LinkedIn group as a member is subject to the removal and approval of the LinkedIn Group admin. For example, some groups restrict you from sharing self-promotional posts, sales advertisements, and content that offers no real benefit to the group’s overall objectives. 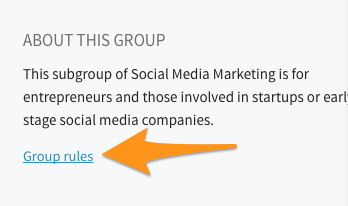 You can find a Group’s objective by reading more about the Group above the Group rules section. That means to say, that as a member, the number of things that you can do to share content isn’t that much. But as you shall see, there are ways to go around this. 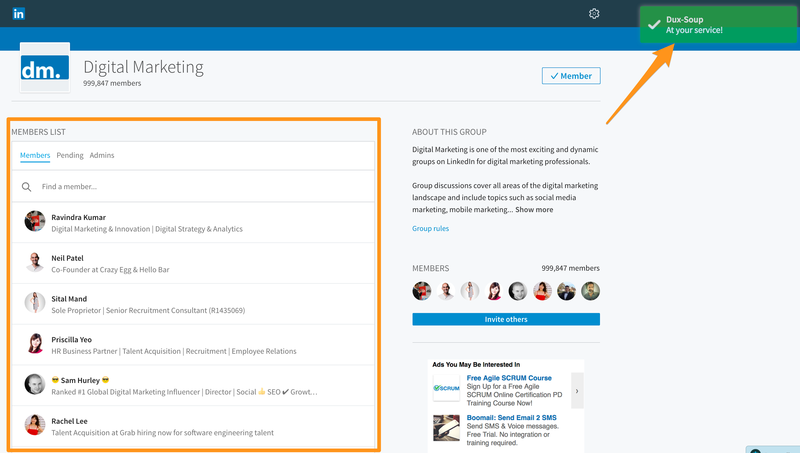 The next aspect of LinkedIn groups is as a group owner. A group owner is simply someone who starts a LinkedIn group or is appointed as a group admin by the group owner. As a group owner or admin, there are various other options that are open to you, as you shall see. 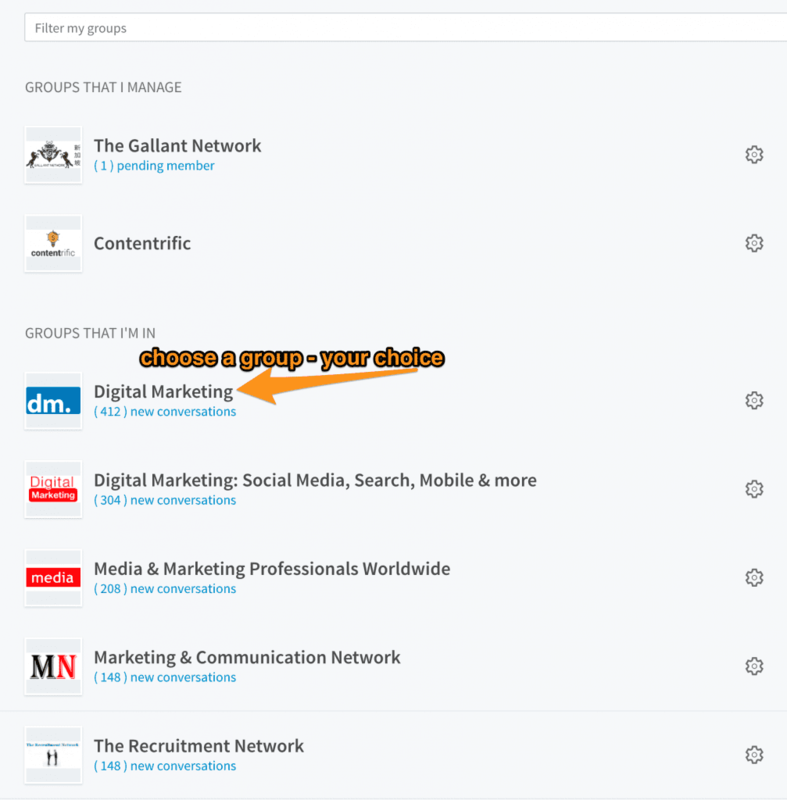 Firstly, however, let’s take a look at the different options that you can use to generate leads from LinkedIn groups as a group member. As we mentioned above, being a group member severely limits the amount of content that you can share, and the type of content that you can distribute. That being said, it is still possible to leverage on LinkedIn traffic to get consistent leads. The first step is to find as many relevant groups as you can that align with your industry or your relevant area of expertise. For example, if I’m a content marketer, I would look for groups that are not only about content marketing, but I will also try to join groups that are relevant content marketing, such as copywriting, and digital marketing. Joining groups is a relatively simple process. 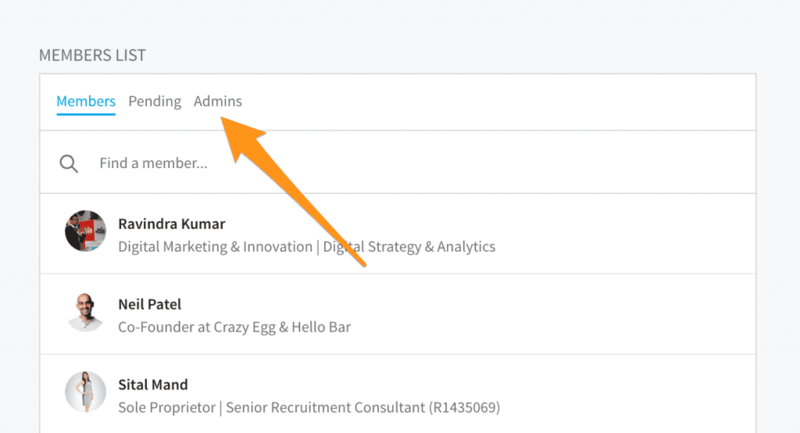 Firstly, go to your LinkedIn dashboard, and search for a button that says “Business” at the top. Click on it, and you should see a drop-down menu. Click on Groups, and you will be redirected to the Groups page. Once you are the Groups page, there are different ways that you can join groups. If you already have groups that you are a part of, you can skip this step, and move to the next section. Click on this button to view your current groups. 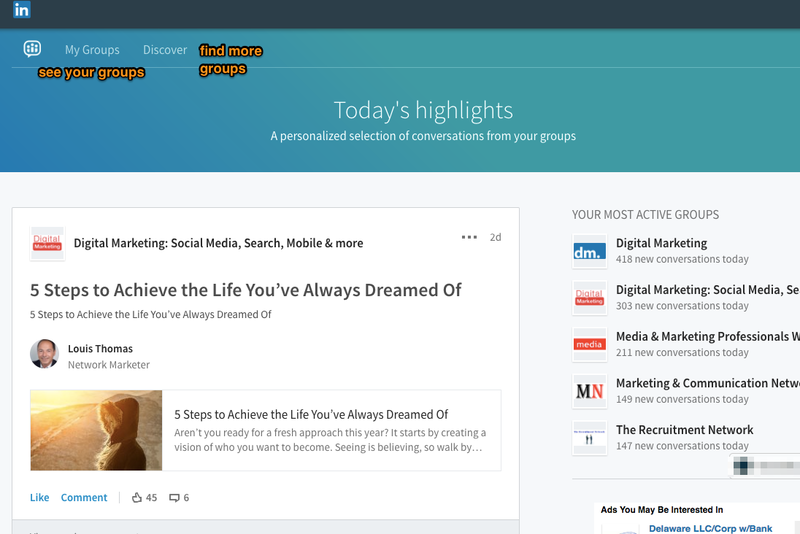 However, for the sake of those who are not yet part of a group, let’s dive deeper, and click on Discover Groups. 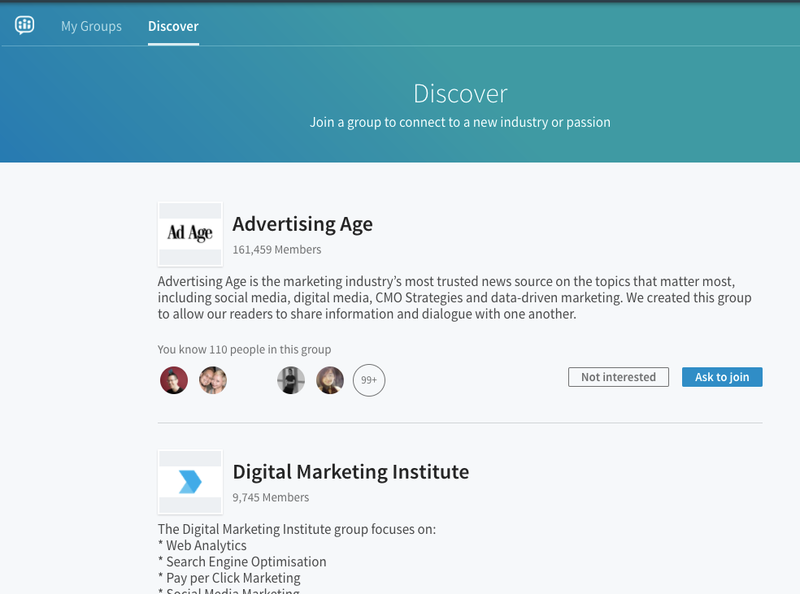 By default, LinkedIn already filters groups by your industry (bet you didn’t know that!) and recommends groups for you to join. 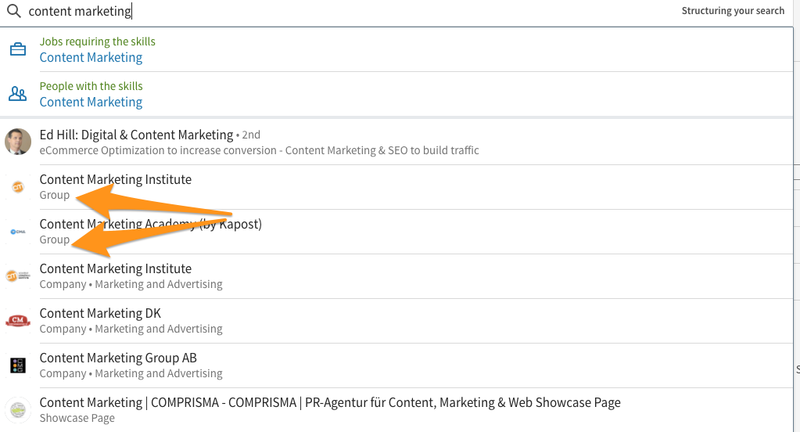 For example, since my field (content marketing) is somewhat related to Advertising, LinkedIn places it at the top. You can easily scroll down the page, and find groups that you want to be a part of. Some groups are open groups, but some “Like Advertising Age” are closed ones and require you to apply to join. In case you can’t find the group that you want to, let me show you another way. Since LinkedIn’s new UI actually makes it harder to use the Advanced search function, let’s use our trusty friend, Google. Go to the top of your browser, and type in “LinkedIn Advanced Search”. You should see the right suggestion pop up at the top. Click on that, and you should be redirected to the Advanced Search page. Then, on the search bar, click on the button that says: Groups. The next step is relatively straightforward. Type in your industry, or a keyword that you are interested in. 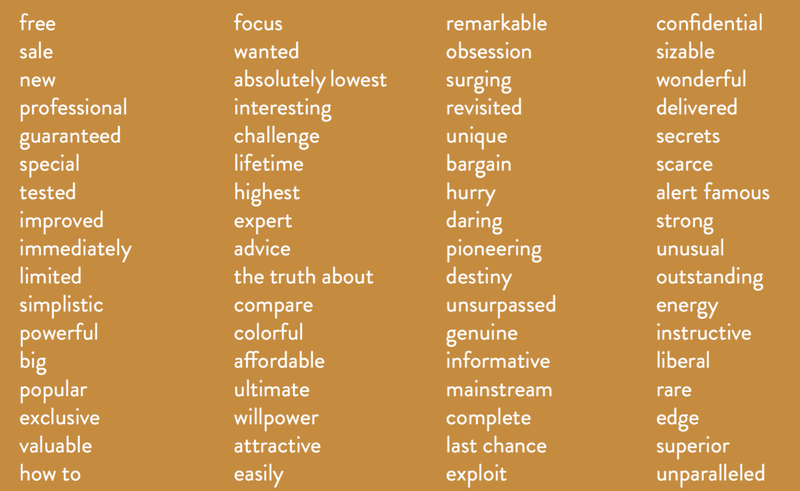 For example, my keyword is “content marketing”. To tell if the suggestions that pop up are a Group, you can look at the tag it comes with, as you see in the screenshot above. Once you’ve decided on a group that you are interested in learning more about, click on it. Next, you will want to read more about the group, under the About Group section, located on the right-hand side. If you think that the group is a good place to distribute your content, click on Ask to join, and wait. Step 2: Create a piece of content that is of super value to that group – make it relevant! Now that you have a few LinkedIn groups under your arsenal, it’s time to create content that actually attracts the right people to you. That means you need to find the best topic to write about. I always find the following checklist useful whenever I try to create content for a particular group of people. What type of people does this group consist of? What are the end goals of this group of people? What motivates this group of people? What topics is this group of people most likely to be interested in? Once you have decided on the topic(s) that your LinkedIn group is most likely going to be interested in, you want to decide on the type of content to create. For example, you can choose to either create a video or a blog post, depending on the purpose of your content. Remember, whatever the form of content that you create, it has to be relevant to the groups, and the people in the groups. I have seen it too many times before, clients of mine who come to me saying that LinkedIn didn’t work for them, but it turns out they were talking about totally irrelevant stuff, sharing information like sales funnels in a LinkedIn group about book publishing. If you want to take your content one step further, make sure to include a lead Magnet, otherwise known as a Content upgrade. A content upgrade is simply a piece of information that is relevant to that particular post so that it maximizes the chance of a reader actually converting into a subscriber after reading or watching your content. If you’re reading a blog post about sales funnels, and there’s an offer asking you to opt into a checklist that helps you to solve the problem easily, why wouldn’t you opt in? Now that you’ve created your super valuable content, it’s time to distribute it, and share it extensively on the LinkedIn groups that you have joined. 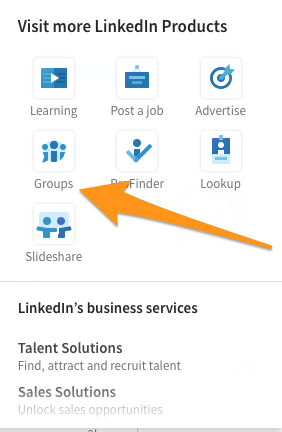 LinkedIn makes it relatively simple for you to share it among your groups. 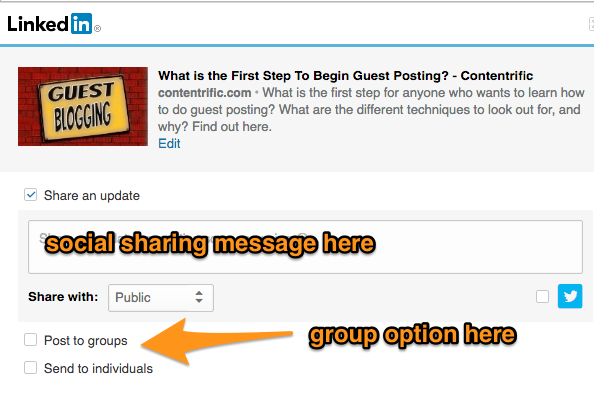 Make sure that you enable the “Post to Groups” option before you proceed to the next step. Important: When sharing your content, the message you write in your social update is as important as the headline in your blog post: If it doesn’t entice me, I’m not clicking through! A social sharing message is that block of content that you write, that accompanies your article share. 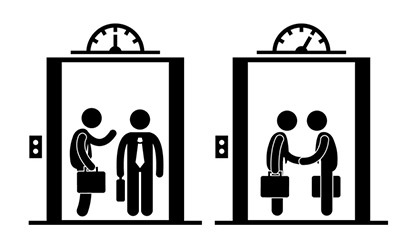 Simply put, it is your elevator pitch to the LinkedIn group and should reveal just enough for Group members to want to click through to your article. Can you include any statistics from your findings? Can you include any interesting findings in your content? What is the problem that your content aims to solve? How can you frame that problem in a way that needs to be solved now? Are there any emotions that you can use in your message? For more references, you can use a list of power words such as this. Once you share your content, wait for your content to be approved by some groups – as they undergo moderation. 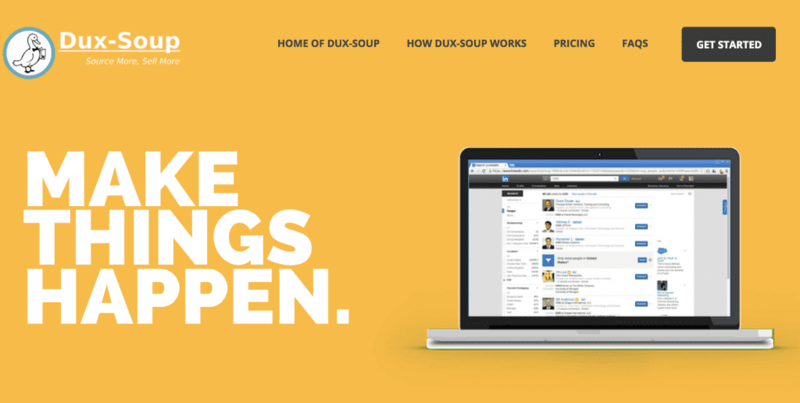 Dux Soup is a software that helps to boost your conversion rates on LinkedIn, using the power of psychology and automation. Essentially, it is a tool that helps you to locate your prospects, visit their profile, so that they are intrigued by your visit, and are drawn into your profile page, which acts as a landing page. 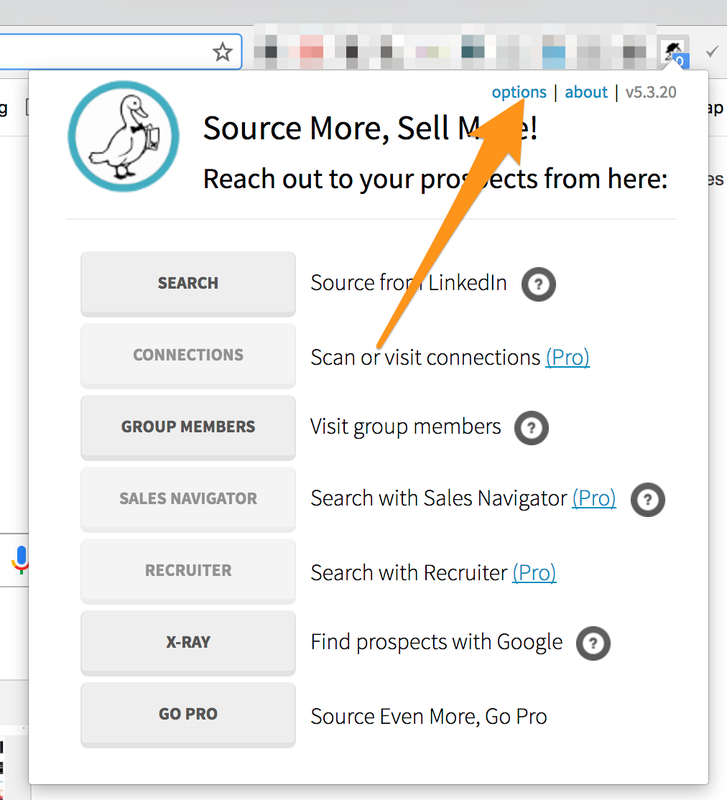 While there are many different tutorials out there about Dux Soup, I realize that not many people talk about using Dux Soup for LinkedIn groups. In fact, using Dux Soup for LinkedIn groups is one of the most highly converting techniques that have worked for me in my content marketing journey so far. To get started using Dux Soup, the first thing you have to do is to download the software. 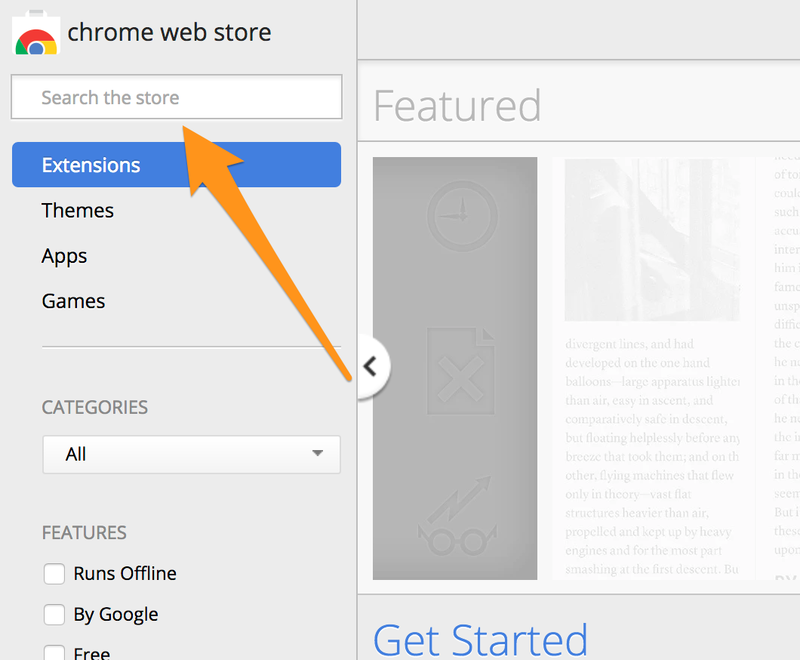 Open up Google Chrome Store by going to the right-hand corner of your Chrome dashboard. 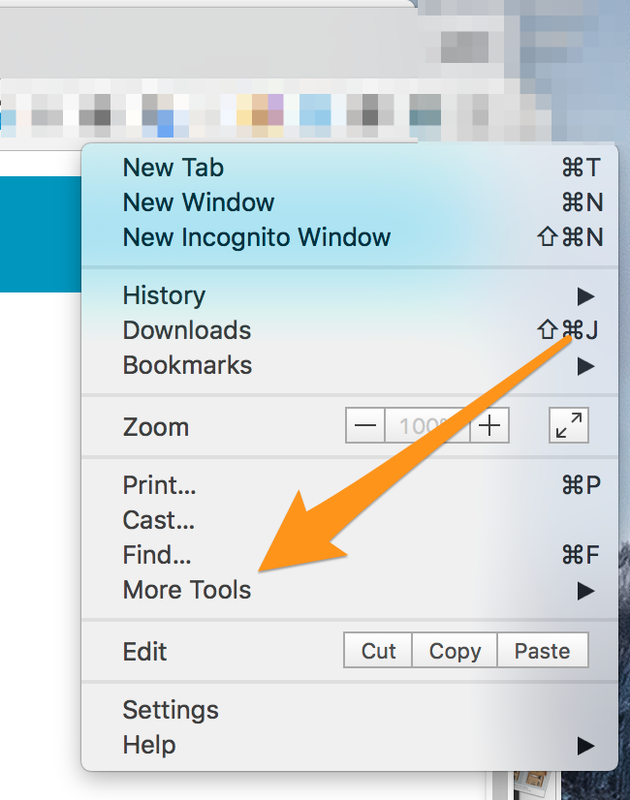 Click on More Tools, and then Extensions. Next, click on extensions, and you should be redirected to the Chrome extension page. Scroll down to the bottom of the page, and you should see a button titled “get more extensions”. This should redirect you to the Chrome Web store. Next, go to The search bar, and type in Dux Soup. click enter. Download Dux Soup, and you should see the extension popping up on your Chrome dashboard on the top right-hand corner. Next, open up a new Chrome tab. Next, we would want to make a few quick adjustments to the options in Dux Soup. Click on the Dux Soup icon, and click on the options button. 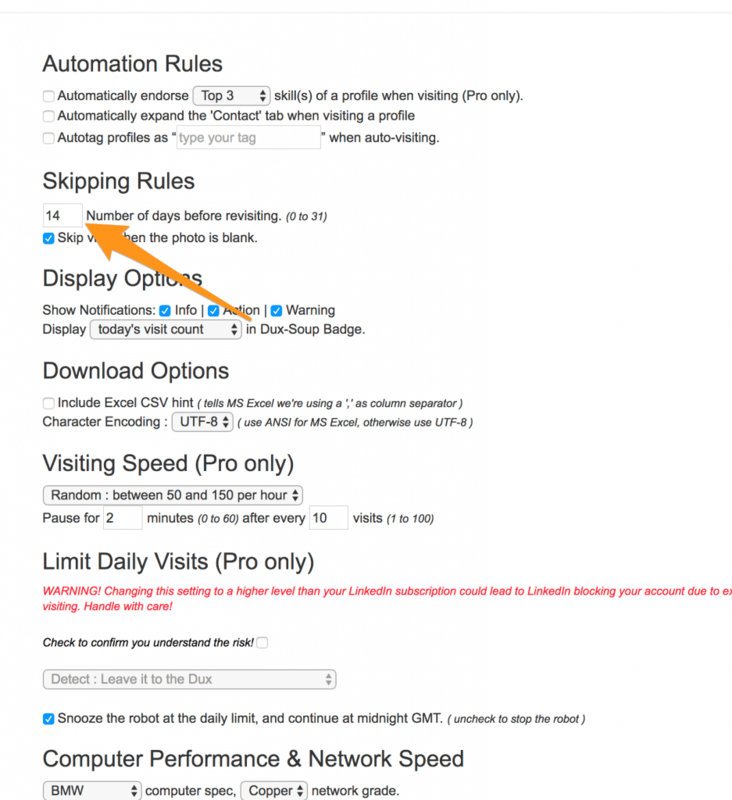 Under the section titled Skipping Rules, set the default to 14 days. In other words, if you have used the software to visit a particular profile for the last 14 days, we want Dux Soup to avoid that. This is to ensure that we do not waste the limitations that the free account has; in other words, allows you to maximize the use of Dux Soup, and let you visit as many different accounts as possible. 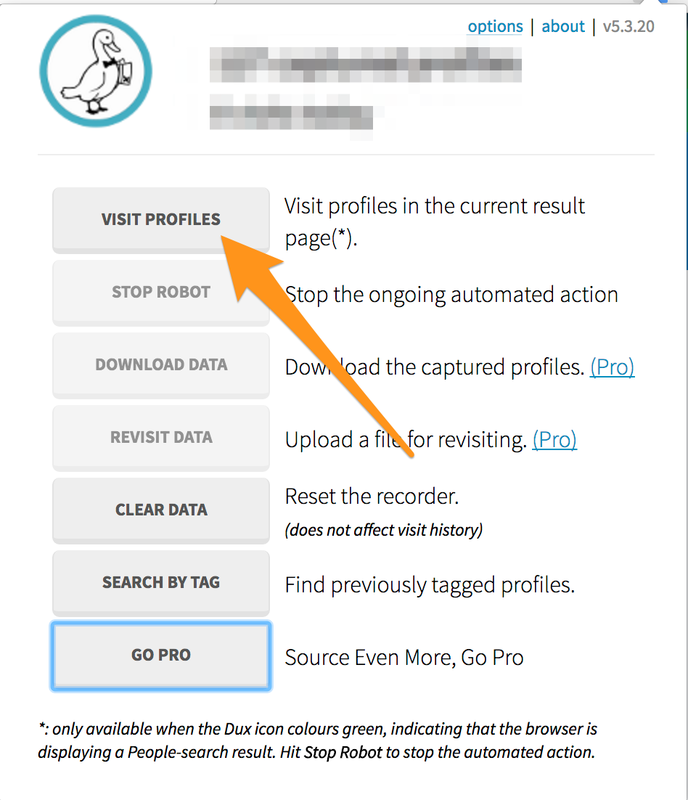 Since the free version of Dux Soup only allows you to visit up to 100 profiles per day, this means that you have to make the full use of the software in any single day. 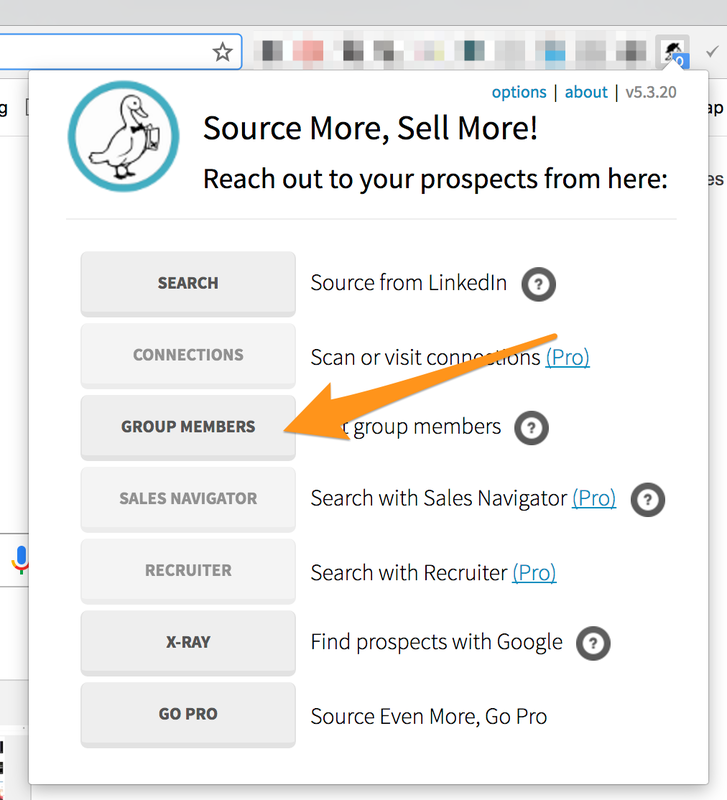 Next, click on groups, and you should be redirected to your LinkedIn Group Page. Choose a group that you want to use Dux Soup full, and click on it. In this example, I shall visit the Digital Marketing Group that I’m already a part of. Next, you’ll want to click on the number of members in the group. This will open up the list of members that are residing in the group. At the same time, you should also see Dux Soup giving you a heads up, like this. Now, it’s time to command Dux Soup to begin visiting the different profiles. Click on Visit Profiles, and Dux Soup will begin the visiting process. Once Dux Soup has finished visiting the profile up to 100 every single day, you should see a notification telling you that you have reached the limits for that particular day. As long as you repeat the process every single day, without fail and with consistency, you should see a steady rise in the number of visits to your profile, as well as the number of engagements. Pro tip: if you own a copy of the paid version of Dux Soup, it also allows you to endorse the profiles that you visit. To enable the feature, simply go to the section titled “Automation Rules”, and check the box that says: “Automatically endorse the Top 3 skill(s) of a profile when visiting”. That adds another layer of engagement, it seems. From my own content marketing experiments, the reply rate tends to be higher when you take the initiative to endorse the skills of every profile that you visit. We cover this technique in closer depth in Step 6. Another powerful way that you can engage with the group members is by sending them a direct message. To send Group members a Direct Message is really easy. Go to the Groups page, and open up the member’s list by clicking on the number of members in that group as I’ve shown earlier. Click on the mail button, and you’ll be redirected to a Direct Message Box to that member. Sadly, this is the part where I see many people messing up as well. In your first message, you should not, and should never try to sell anything but a conversation and relationship with the other party. Think about it this way. Would you like it if you were walking along one day, and you see a random stranger come up to you and start selling something to you? Hey [insert name of connection], great to be connected with you in [ insert name of group]. I’m always on the lookout to be connected with like-minded individuals like yourself. How are things going on your end with [insert name a company]? Take note that not everyone will reply to your message, it’s to be expected. However, you will definitely see a response from some people, which you can then take to the next level by building rapport, and slowly pushing them to the next stage of the content funnel with your sales and qualifying process. Before you proceed to learn step 6, understand that this step requires you to have a paid version of Dux Soup. From my own experience, I found that by endorsing the top three skills of the group members that I visit, the level of Engagement and replies that I got increase by over 200%. This makes sense, since LinkedIn sends a notification about your most recent endorsements, and asks if you would like to thank the person who endorsed you. In other words, it makes it really easy for the group member to reach out to you. This is where you can take it to step 7. Once you get any form of replies from these group members, it’s time to engage them with your content. At this moment, you should already have created a relevant content for the group members to view in Step 1. Thanks for your reply/ Message. By the way, I’ve just created a piece of extensive information about [ insert topic]. By personalizing the message, and the fact that you are replying to a message that the group member has sent, I found out that this significantly enhances the open rate, as well as that Click through rate to my content. 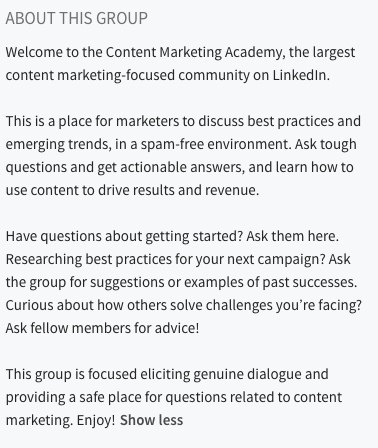 If you are a seasoned LinkedIn group, you will know that it can be hard to draw attention to your content, especially if the group is very active, with new content being posted constantly. That being said, I found out that comment in the group on the active discussions I actually a very good way of Distributing your content that gets read. Discussions that highly engaged with by the group members content that is closely watched by the commenters, but is also more likely to draw the attention of existing group members. Remember, the more relevant and valuable information to share with the group, The more likely they will be to check out any new discussions that you post in the future. Is this discussion relevant to my industry? Can I provide any comments that are insightful and valuable to the group members? Can my link provide further study on the problem, and how to fix it? Once you pre-qualify the discussion, and you decide that it is relevant to you topic, it’s time to comment, and engage in the discussion. Always make sure that whenever you link to your own content, it has to be relevant to the point that you make. Nothing turns readers off more than being redirected to a page that it’s not related to solving the problem. Another interesting and creative way that you can get your word out to LinkedIn groups is to make a deal with the group owner. 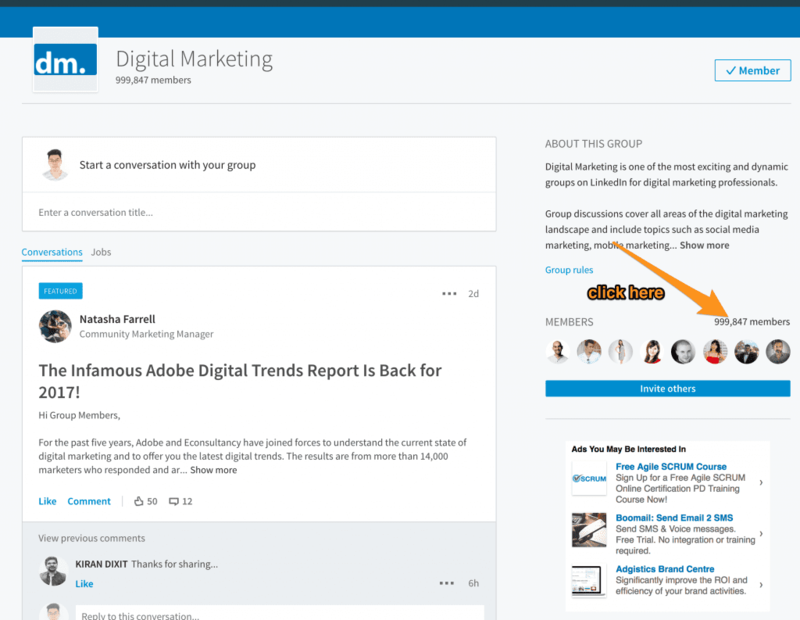 As I mentioned earlier, all group owners of LinkedIn groups have the ability to make an announcement to the entire group. They can also pin your discussion at the very top of the group, which obviously gets you more eyeballs and more leads in the process. Approaching a group owner is very much like approaching an influencer. The key is present yourself professionally, and build a relationship, before you ask for any favors. The first step is to identify who the group owner is. You can do so by going to the member’s list. Under the member’s list tab, click on Admin. Click on it, and you should see a list of the Group Admins. Again, you can send Group Owners a direct message by hovering over their names and clicking on the mail icon. Next, you will want to drop the group owner a message, and introduce yourself along the way. Remember, at this stage, we don’t want to sell anything but a relationship. I hope things are going well with [ insert name of company]. That being said, I just wanted to reach out to you, because I think you’re doing a fantastic job with [ insert name of group]. Now that you have sent the group owner and introductory message, it doesn’t mean that you can expect a reply, simply because they might not have time to reply to a message, have too many messages, or just didn’t see it. But that doesn’t mean that your work is done. Instead, you can look out for posts by these admins on the group. Read through what the discussion is about, and note down the group owner’s viewpoint on the topic. For example, suppose the group owner has written a piece of content or started a discussion on the group about a particular method of doing things, he or she would no doubt list down the reasons for thinking in that particular way. That being said, you can comment on these discussions by sharing your own inside, and following the steps that we have a little later in the comment section. By now, if you have engaged the group enough, you should have gotten the attention of the group owner. This means that it would be a good time to send them another message. It’s been awhile since I heard from you, ever since my last message. Just wanted to check in, and see if everything was going fine. P.S. love your discussion on [insert name of LinkedIn group] on [insert topic of the discussion you just commented on], by the way, I’ve also shared my insights there as well. Let me know what you think! Finally, once you have some kind of a conversation going between you and a group owner, it’s time to request for a possible collaboration between the both of you. Hope everything’s going fine with [ insert name of LinkedIn group] and [ insert name of group owner’s Company]. I was creating this piece of Epic content on [ insert topic], and I was thinking who might be interested in reading this, and getting epic value out of it, when I thought of [ insert name of LinkedIn group]. Being an active member of [ insert name of LinkedIn group], I’ve come to appreciate and understand the members who are in the group quite extensively. That being said, I am quite confident they would be able to bring their understanding of [ insert topic] to the next level with this guide. I want to put it up front that my intention with this guide is not to sell anything but to really add value to everyone in [ insert name of LinkedIn group]. That being said, [ insert name of group owner], I was wondering if you would like to do a possible collaboration between the two of us, to do a group announcement about this piece of content? Whatever the outcome, [ insert name LinkedIn Group owner], keep Rockin this group! If all goes well, and you follow the steps that I’ve laid out extensively earlier, getting the group owner to post an announcement on your behalf shouldn’t be too difficult. 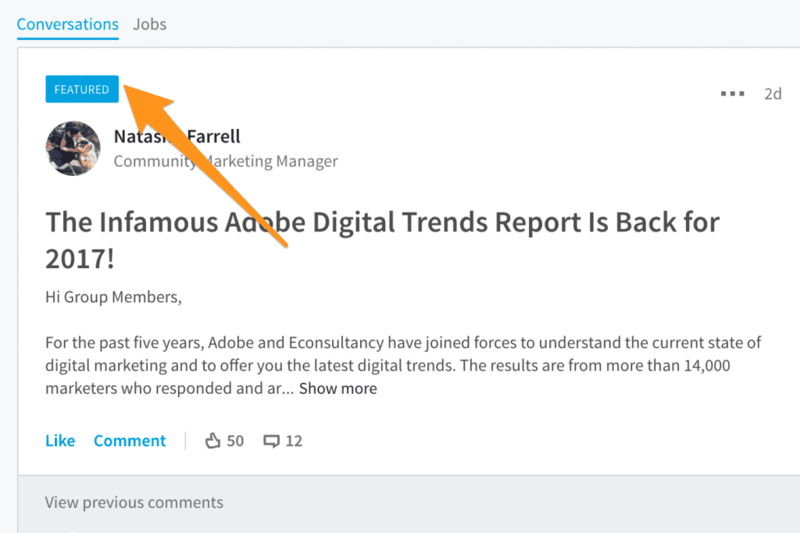 At every step of the way, posting on LinkedIn groups can bring you a ton of quality leads and sales opportunities consistently. However, take note that at the end of the day, you don’t have control over whether your content is distributed or not. Therefore, you should always keep in mind the limitations, publishing requirements, and restrictions if there’s any. At the end of the day, LinkedIn groups offer a cheap and cost-effective, sometimes free, way of getting the word out about your content, and translating that traffic into conversion, leads, and sales. 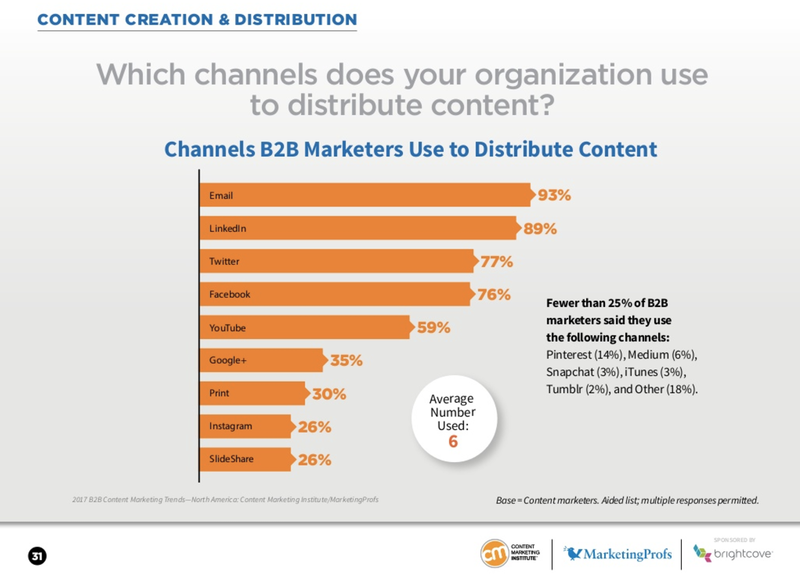 The key, however, is to approach LinkedIn content distribution as a relationship building game, just like any other content distribution technique out there. Remember, those are real humans behind every single profile! Did I miss out any steps that you can take to generate high-quality leave continuously in LinkedIn groups? Do you have any other techniques on LinkedIn Groups that can help to generate more leads? Share your comments down below! I read every comment. John Chen is most commonly referred to as the Human Guinea Pig in Content Marketing. His Content Marketing Experiments and Product Reviews have helped thousands of business owners, entrepreneurs and bloggers find clarity in their brands, and take their online presence to the next level. 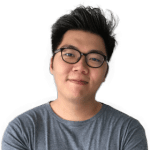 He has helped professionals from multinational corporations like Microsoft and Accenture scale their personal brands with the right content and powerful words that persuade and sell. John is now carving his own content marketing journey at Contentrific, where he shares his every step and move to a $100,000 per month brand. You can catch John on Twitter @Contentrific, read more about him here, or listen to his content ramblings on his site Contentrific, where he teaches entrepreneurs, professionals and small teams to grow their audience the right way with persuasive content.